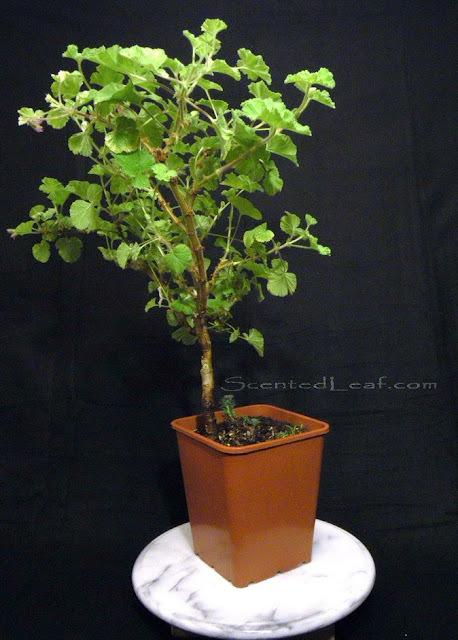 Pelargonium x citrosum aka Scented Pelargonium Prince of Orange aka Scented Geranium Prince of Orange is an upright grower plant with citrus scented foliage. Due to the compact columnar habit, usually they are trained in formal upright standard style. 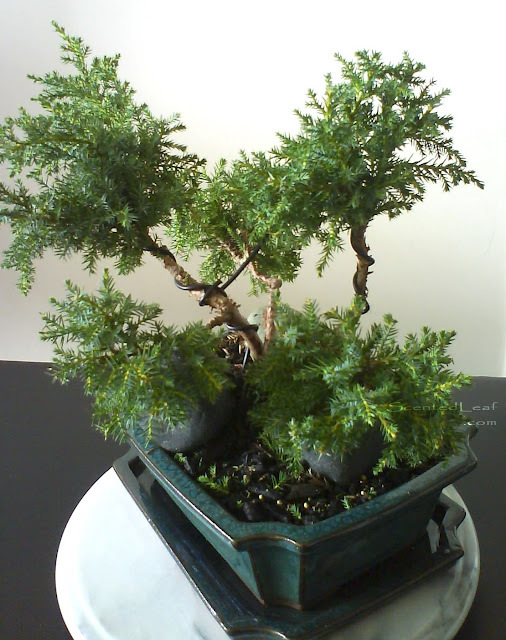 But if you wish ... and the perseverance is one of your skills, you can train them also in other bonsai like styles. This bonsai, like many others, so dear to my heart, is "Edible, fragrant, very useful, showy, flowering, drought resistant, little care and very forgiving ..."
We decided to make another cascade bonsai from one of our plants, and after few months of trainings, the result was really interesting. The woody stem tends to become leggy unless it is pinch back - so initial we left some branches to grow longer for few months. (the plant did not look so great in that period) . 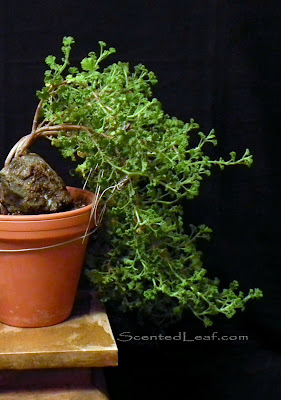 Last year, when summer began, we re-potted it and we bended the stem and side branches (before become too woody) over one big calcite rock. 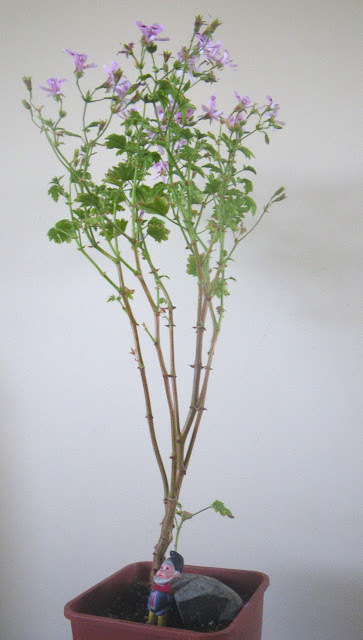 Then we pinched them back at every 2-3 weeks - to obtain a lush foliage with small roundish leaves. Still under training, to create and develop the main trunk and crown, upright growing apex, because only the branches are supposed to cascade ... not the entire tree. Usually the leaves are roundish with a crinkled edge and let a delightful scent in cooking: in sauces, desserts, lemon chicken or salmon. "Prince of Orange" flowers are larger than other scented pelargonium varieties, pink with small dark stippling on the upper two petals and are very appreciated by the bees (who collect nectar and pollen all blooming season). When the blooming season was gone (at the beginning of September) I obtained many curly-tailed seeds as a result of pollination process. 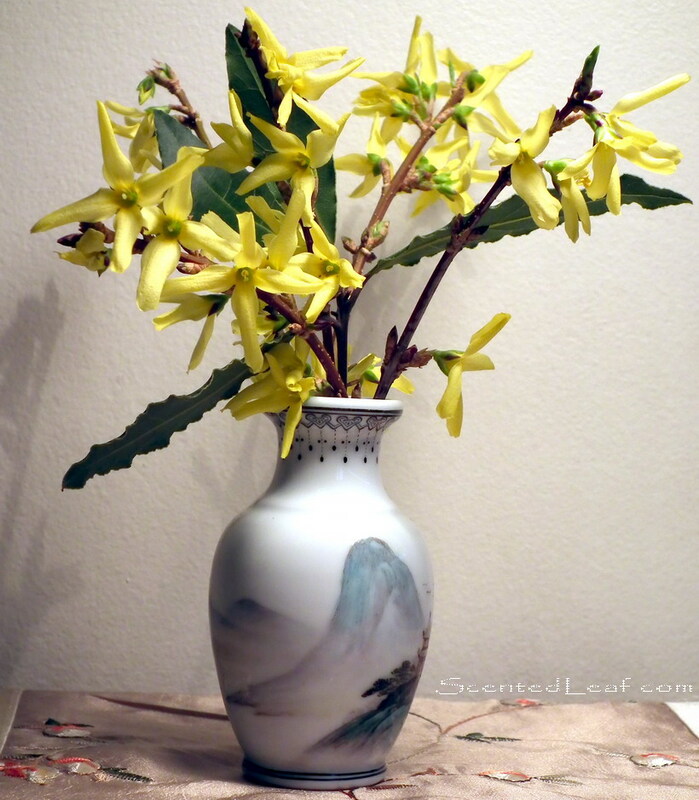 Forsythia flowers in miniature hand-painted Chinese vase Qianlong style. 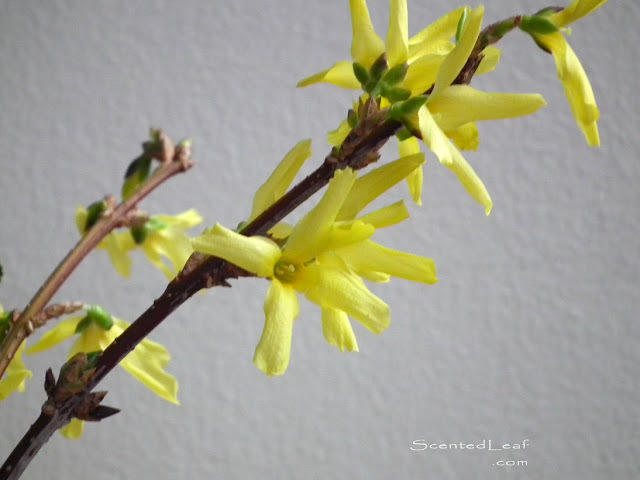 For most people, seeing the golden-blossoms of Forsythia flowers is one of the first signs of spring arrival. Forsythia is a genus of flowering plants in the family Oleaceae, named after the Scottish botanist William Forsyth (1737–1804) - royal head gardener and founding member of the Royal Horticultural Society. There are about 11 species of Forsythia, most of them native to eastern Asia(one is native to Europe), all of them making stunning golden blossoms bushes. Two of them: Forsythia × intermedia and Forsythia suspensa are commonly cultivated in gardens and parks. Mine is Forsythia × intermedia and I like it because is smaller with vivid flowers and upright habit. As usual, this season I forced some branches to bloom indoor. Although in Vancouver is not so cold, they are blooming in the garden when the spring occur, somewhere at the beginning of march. 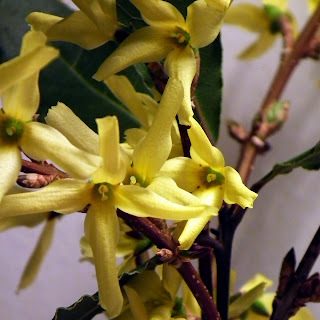 I know, Forsythia is not a showy bush the rest of the year, but I keep it in relative compact form, by pruning every spring its branches after they have flowered. 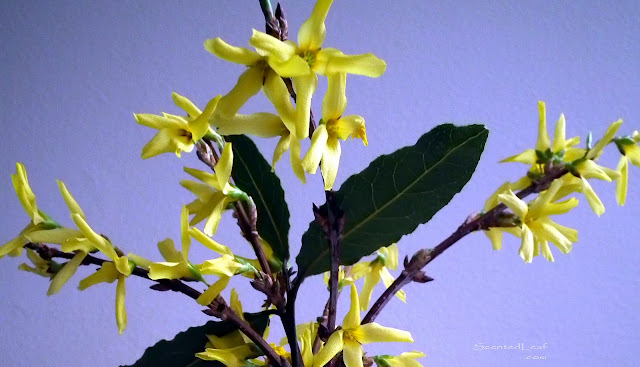 In December I had cut some branches and I forced them to bloom indoor. I put them in a glass with water with some hydrogen peroxide in a spot with natural light. After a week spent indoor, their flowers were blooming (they are super easy to root in water, too, but this was not my intention). 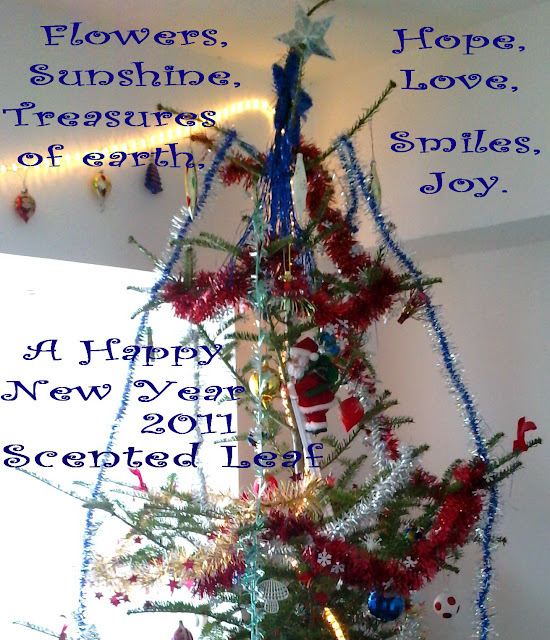 In the New Year Eve these flowering branches brightened my house. 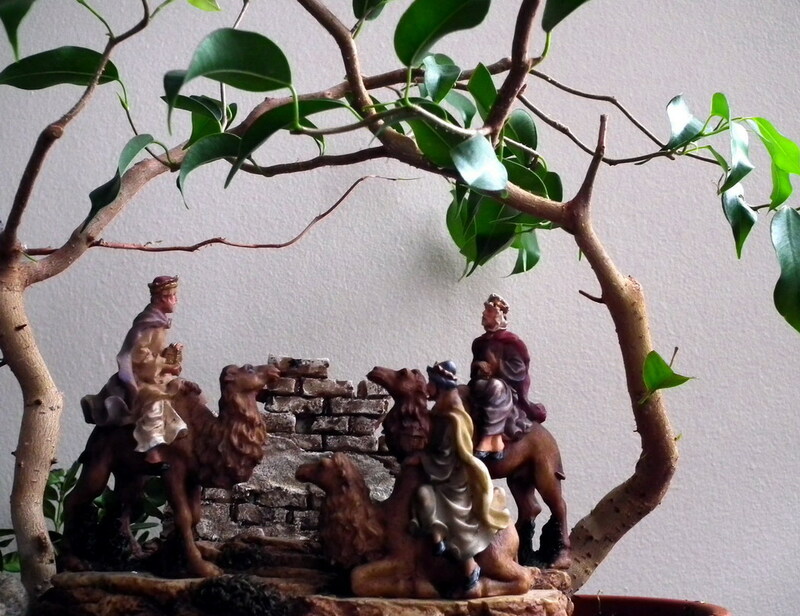 I added also some small branches taken from my laurel tree (laurus nobilis) to decorate my room. 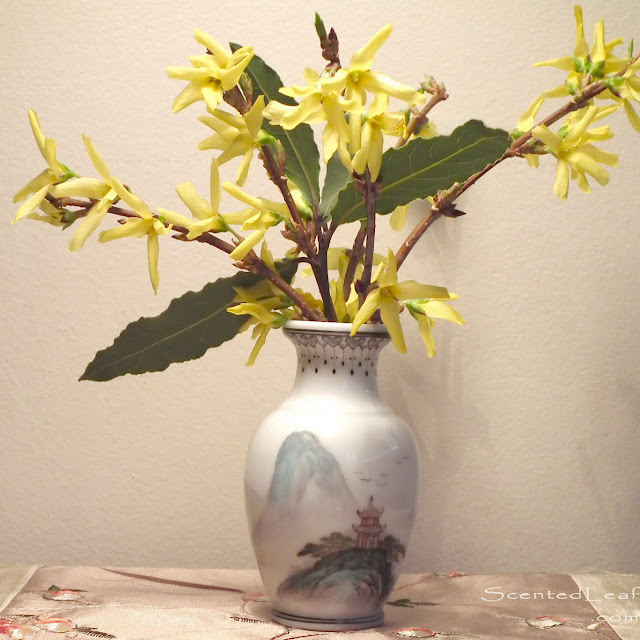 This small bouquet of flowers has found its place in my living-room in one of the small Chinese vase from my collection, to welcome the New Year as a symbol of Joy, Victory and Prosperity. At 10:00 on January 26, 2011, thousands of British Columbians will “Drop, Cover, and Hold On” in the Great British Columbian ShakeOut, the largest earthquake drill in BC history! Earthquakes usually occur when two of the earth's tectonic plates meet, after volcanic eruptions, or underground explosions. During them and afterward, the rock and ocean plates start moving and continue to move until get stuck again. The Pacific plate has an intense tectonic activity along the west coast of North America, but many earthquakes occur also throughout most of eastern Canada. So, we all must get better prepared for major earthquakes, and also practice how to protect ourselves when they happen. The purpose of the ShakeOut is to help people and organizations do both. Do you know how to make your home a safe place during an earthquake? Can you beat the Quake? Play this game and find out. To secure your top-heavy furniture, mirrors, paintings, hanging baskets and other objects, use steel bolts. To secure glass, chinaware, porcelains or ceramic items, use putty or gel, don't think they won't hurt anyone. For bonsai and other indoor plants use Velcro type products or non skid mats. Yes they will fly around if else. Keep your emergency kit and other essential items with you. Download various materials from www.shakeoutbc.ca or from http://www.getprepared.gc.ca to learn how to be prepared in case of Earthquake. It is a long time since I wrote my article about my scented pelargoniums bonsai. Well, I know, they are most known as scented geraniums, although their name was changed in 1789 when Charles Louis L'Héritier de Brutelle (1746 – 1800, French botanist and magistrate) has made a study about the differences between Geranium and Pelargonium. That was the period when Pelargonium become a separate species of plants from Geraniaceae Family. 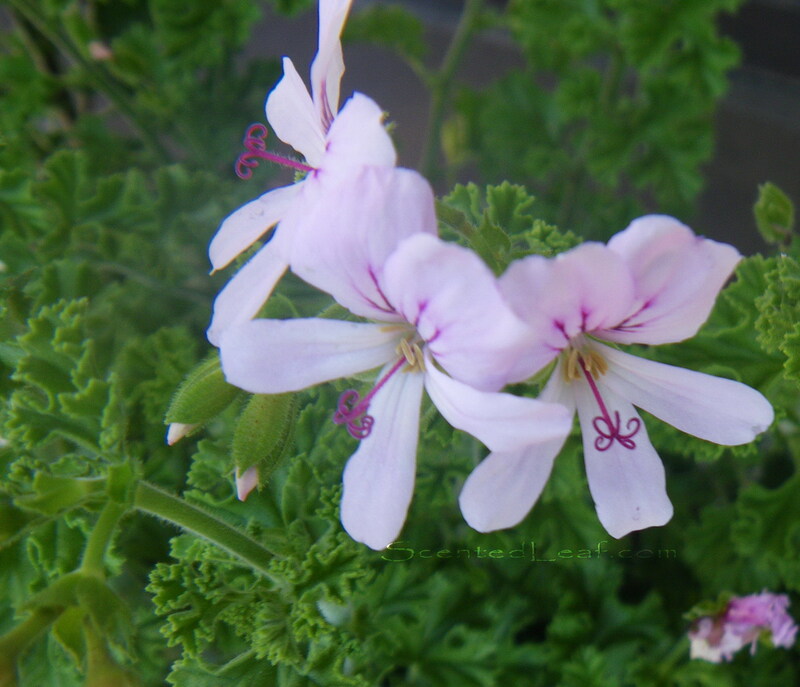 Bye-bye Geraniums ... welcome Pelargoniums! 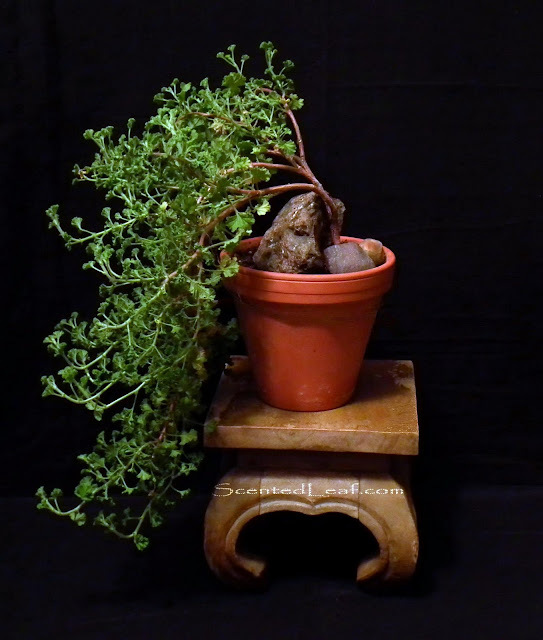 I like to spend time shaping and pruning them ... not sure because their appearance or just to be surrounded by their scents (the scent is more powerful when you cut / crush a leaf and/or a branch). Most of them have bushy allure, but the citrus scented geraniums: "Prince of Orange" and "Frensham Lemon" varieties are growing naturally in form of a column. 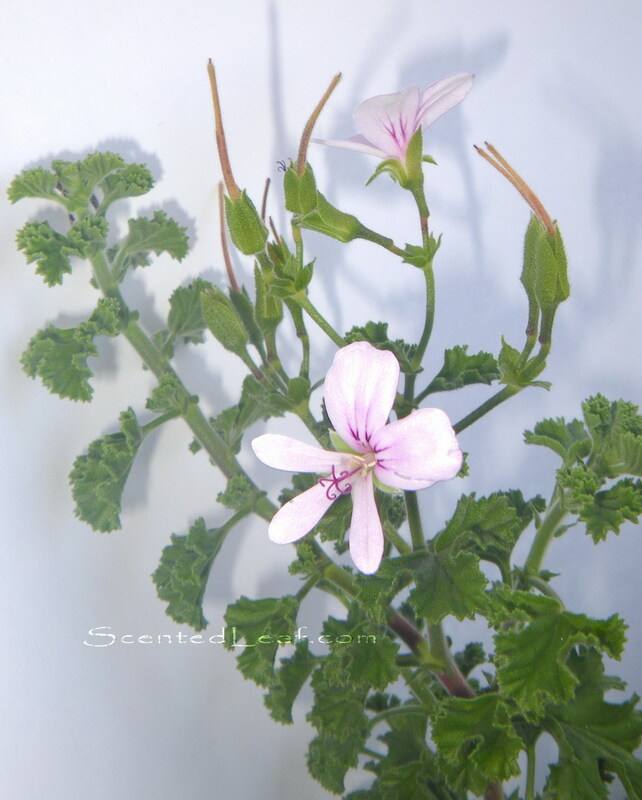 "Scented Geranium "Frensham Lemon" - the stem is growing in the form of a column"
You will fall into a deep state of wonder when you'll first discover their enchanting scent evoking a sense of tranquility. Only if you get around them you'll understand my passion for them. Some of the Rose-scented varieties as Skeleton Rose, Atomic Snowflake or Rober's Lemon Rose presents also a columnar form, with robust, upright habit, but their branches usually wouldn't follow the same columnar form of the main stem and tend to create bushy plants. 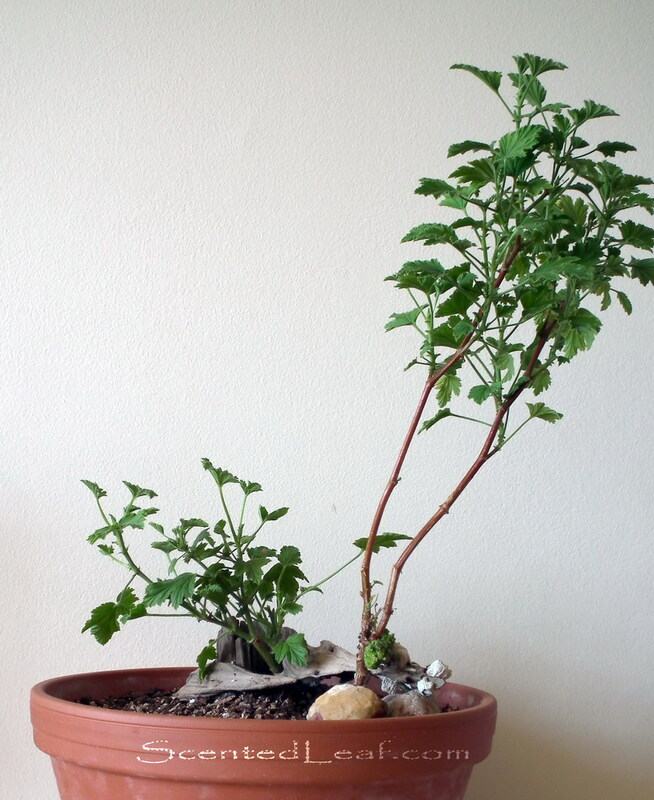 You should trim them regularly because are fast growing plants (and soon you'll have fresh scented leaves to use for yourself anytime). 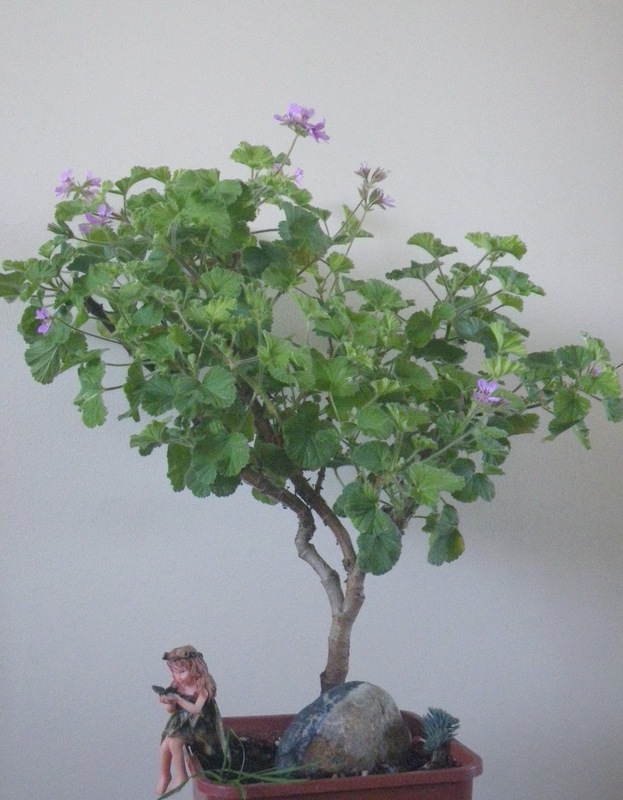 Anyhow, all of them: rose, lemon, orange or lemon - rose scented geraniums might be trained as bonsai or accent plant despite their relative short period of life. These magnificent plants are living only few years (10-15 in perfect condition), and with little efforts you will make them a great attraction to your house & garden. During the winter you should protect them by winter-frost and be aware that many of them became dormant for some months. Everybody needs some sleep, right ?! 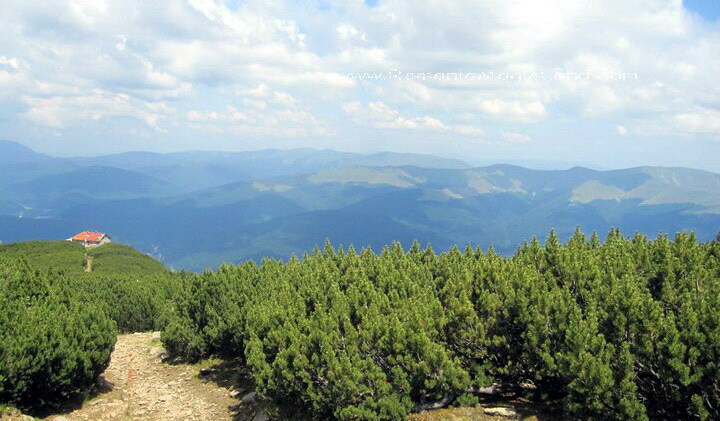 Alberta Spruce is an evergreen conifer with deep-green dense foliage, native North American - originated in coolest forested regions. His scientific name is "Picea Glauca", other names being: Canadian spruce, skunk spruce, Western white spruce, Alberta white spruce or Porshild spruce. In British Columbia, in the Rocky Mountains, the most common variety is "Picea Alberta Albertiana". 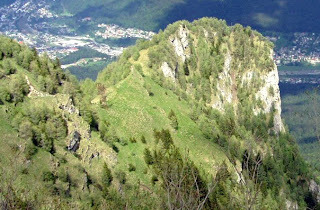 Its wood is harvested for paper-making and is a very important component in constructions industry. In Japan, the Spruce wood imported from Canada (known as "shin-kaya") it is used to make "GO game boards". But in the gardens, the very attractive components of the Canadian home landscaping is a dwarf cultivar named " Picea Glauca Conica". It is a very slow growing conifer (less than 10 centimeters per year) that makes an excellent bonsai tree. 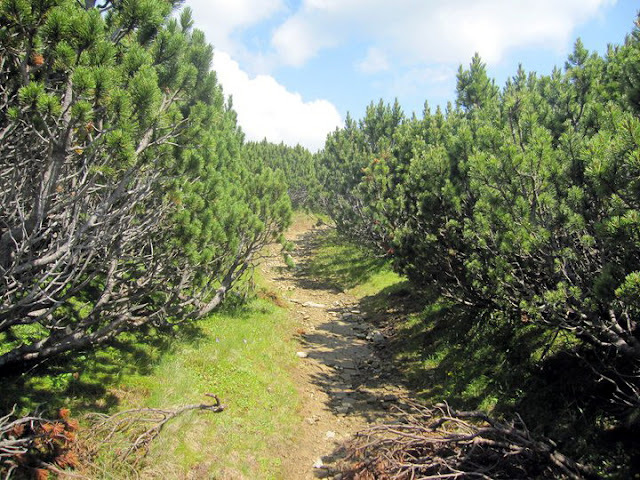 Dwarf varieties grow around 10 feet (the normal Alberta spruce grow bigger - around 40 feet) and need protection for their roots against freezing temperatures, although they should be exposed to cold temperatures during winter. 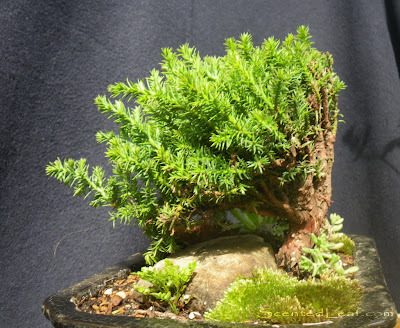 So, as many others before me, 7-8 years ago I fall in love with its natural shape and dense foliage ...and I started my apprenticeship training in the "bonsai world" with a 4 years old, pyramidal Dwarf Alberta Spruce. 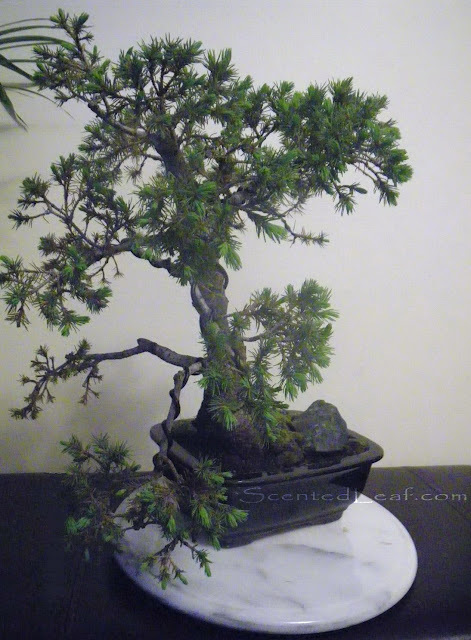 I discovered that these conifers are difficult to wire because they quickly return to their original shape once the wire is removed, due to their incredibly supple branches. 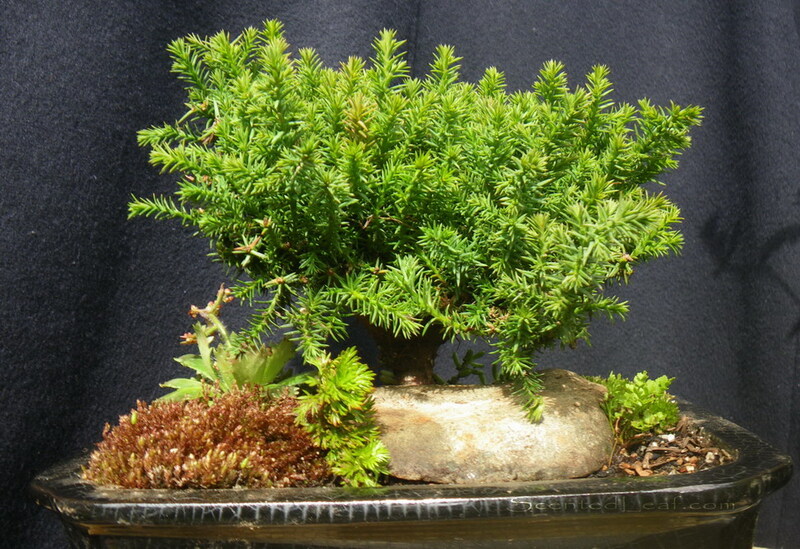 You can choose many styles for Dwarf Alberta Spruce Bonsai: straight or curved trunk, windswept or multi-trunk. 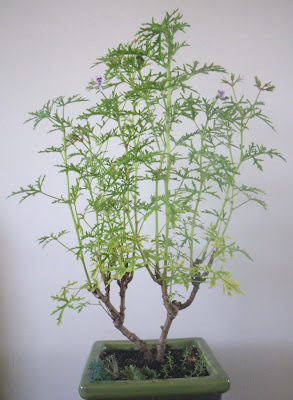 During growing season if you want to keep the plant's foliage dense, you should pinch back half or two-thirds of the new shoots once they reached 1 inch growth. 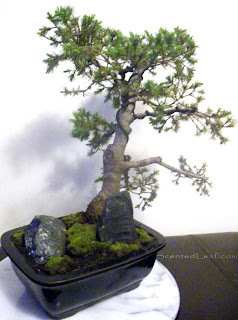 I trained (and abused) this incredible tree for more than 7 years... and now I consider it one of the most "special" bonsai I had, because of its sturdiness and equal fuzziness this tree is capable of. Christmas has been a pretty busy period for us and we are excited to unveil some of the projects we had done meantime. 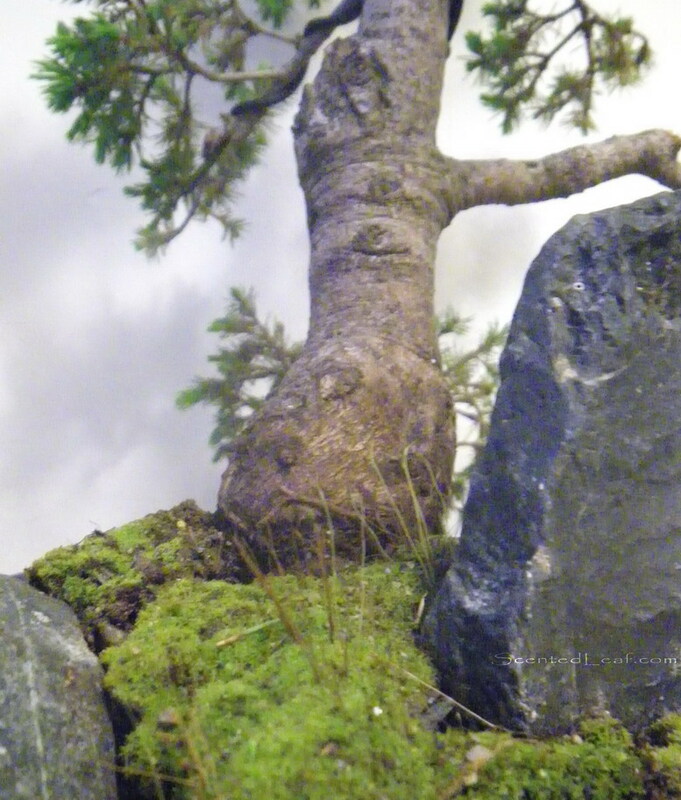 We were doing a gaggle of miniature gardens and coniferous pre-bonsai and bonsai for winter season. Sorry for the long period without a blog post but we'll correct this once we get out of this holiday season. Hope you like the Juniper trees. Juniperus trees are coniferous plants in the cypress family Cupressaceae. The name is derived from the Latin word Juniperus which means "youth producing" or "evergreen". 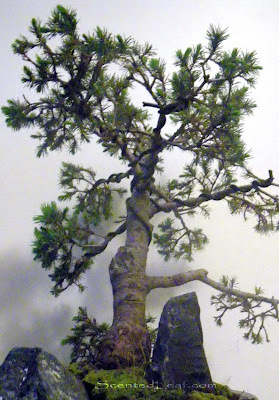 During the Renaissance era, Junipers were used symbolically in art to represent chastity. 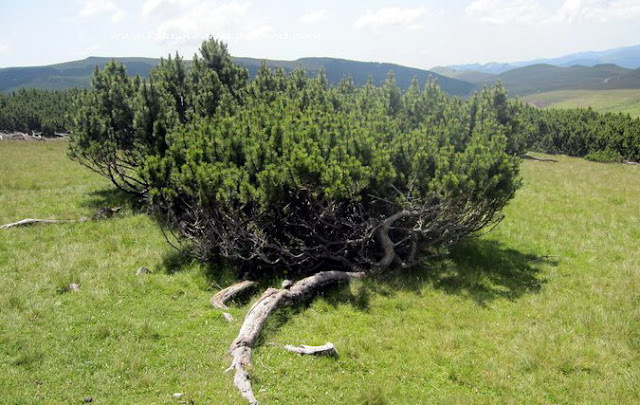 There are more than fifty species of juniper, which vary in shape and size to columnar or low spreading shrubs. 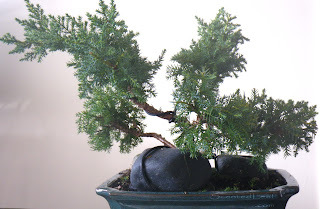 I want to show you some pictures of two of our juniper bonsai. 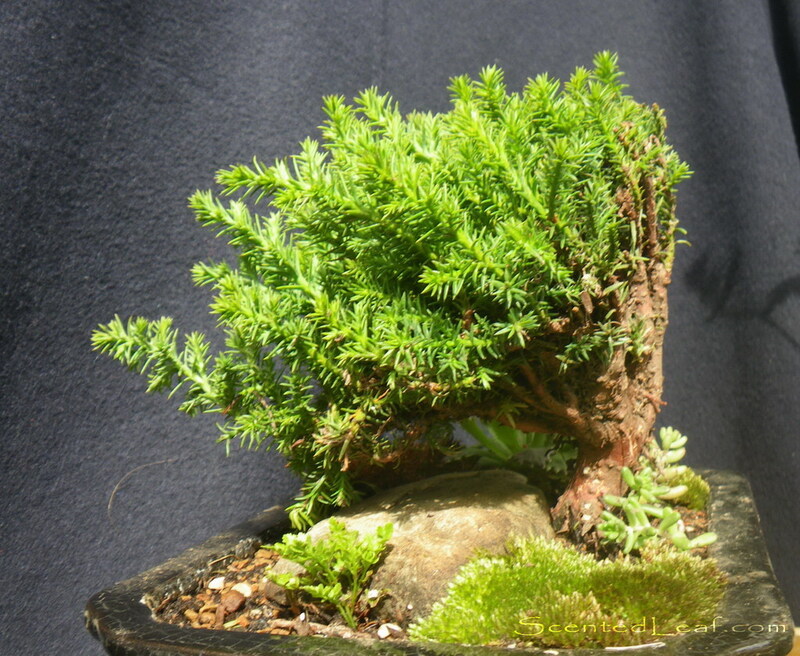 This dwarf specimen (known also as Juniperus Procumbens Nana) that we styled as Kabudachi (clump style) bonsai has 5 years old and only 15 cm tall. This Juniperus Chinensis 'Daub's Frosted' (3 years old) was wired and trained as Sankan bonsai (triple trunk style) for one year. 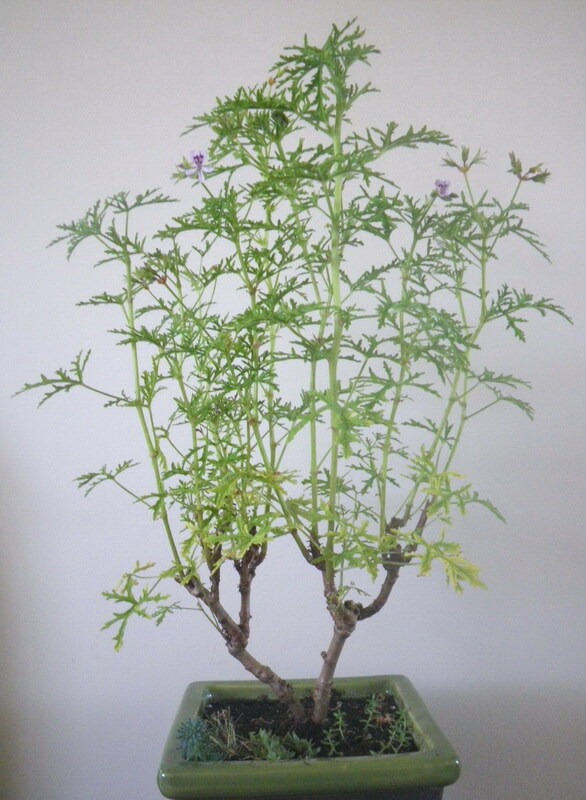 I like its blue-green foliage, with a thick yellow-green new growth. It is a dense, spreading and compact Juniper cultivar very suitable to be trained as multi-trunk bonsai. I like also the delightful juniper's scent - its foliage has a relaxing fresh scent very popular in diffuser oil, aromatic essential oil (can add Juniper to Bourbon Oil), scented candles, scented frankincense, bath sachets and fresh scented soap / cosmetics. Juniper berries (Juniperis communis) are used as a distinct flavoring for a wide variety of dishes and beverages, very known being the alcoholic spirit gin flavor (the name Gin is derived from either the French genièvre or the Dutch jenever, which both mean "juniper"). Juniperus as low-growing conifers are a good selections not only for bonsai, they are very popular mass planting shrubs and ground-covers. Most of the various junipers I've planted seem to do great in Vancouver's climate. The "Common Juniper" is usually a low-spreading shrub found everywhere: from people's lawns to Rocky Mountains. Hope you like them, too. 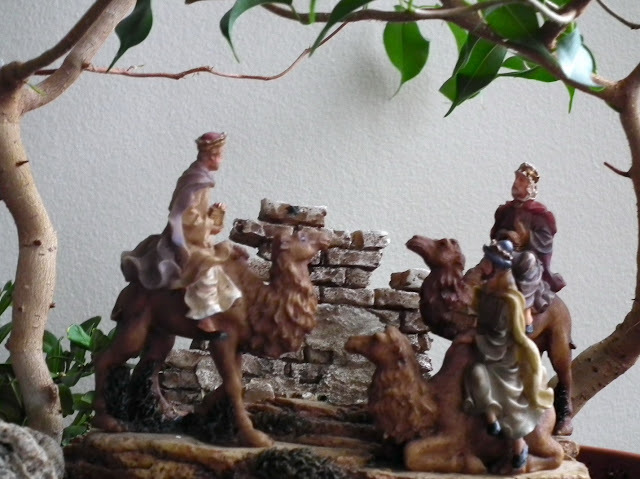 During this Christmas season, I have had a request from a member of my church to make a tray landscape, using the Magi (Three Wise Men) figures in the composition of it. 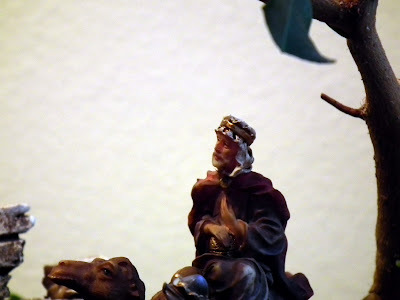 In Christian tradition, the Magi or Kings from the East are a group of Kings who have visited Jesus after his birth, bearing gifts of Gold, Myrrh and Frankincense to worship the Christ. 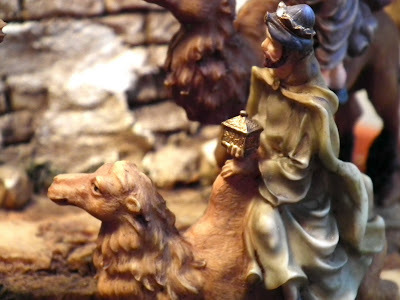 They found Jesus by following "his star" known as the "Star of Bethlehem". Although traditions identify several names for the Magi, for Western Christian Church their commonly known names are Melchior (Melchyor), Caspar (Gaspar) and Balthasar (Balthassar) (mentioned in an old Greek manuscript from Alexandria around 500 A.D). The Myrrh tree, Commiphora Myrrha, native to Arabian Peninsula is belonging to the Burseraceae family and is very used in incense, religious rituals (was considered "a magical herb"), embalming (it was mentioned in an Egyptian papyrus dated 2000 B.C.) , cosmetics and medicine . 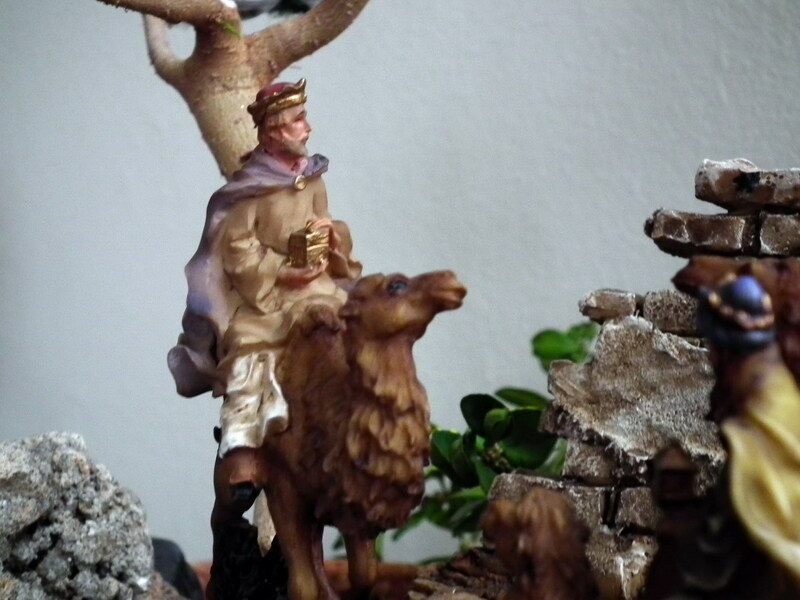 Myrrh tree grows about 2-3 meters tall on arid, rocky soils being adapted to grow under desert conditions. Myrrh is low spreading with a canopy, with ashes- colored trunk and tri-foliate - oval in shape leaves, grown for the valuable oleo gum resin, with redish-brown color, bleeding from the stem (used for the holy oil) and to be burned in fumigators, purifying or religious rituals. 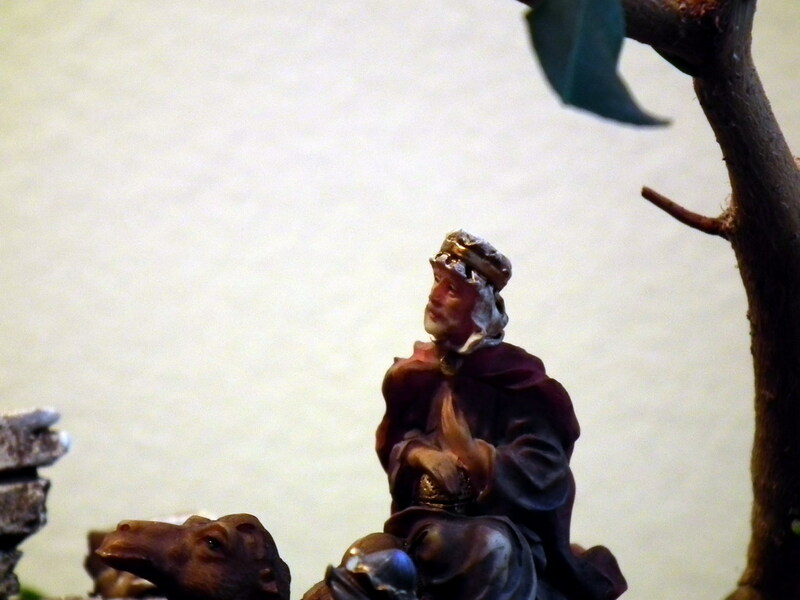 Frankincense is obtained from Boswellia Sacra, other tree native to Arabian region belonging to the Burseraceae family as the myrrh tree. The resin from the yellow aromatic sap was used long time ago as a incense in religious and funeral rituals, being mentioned in Christian writings. 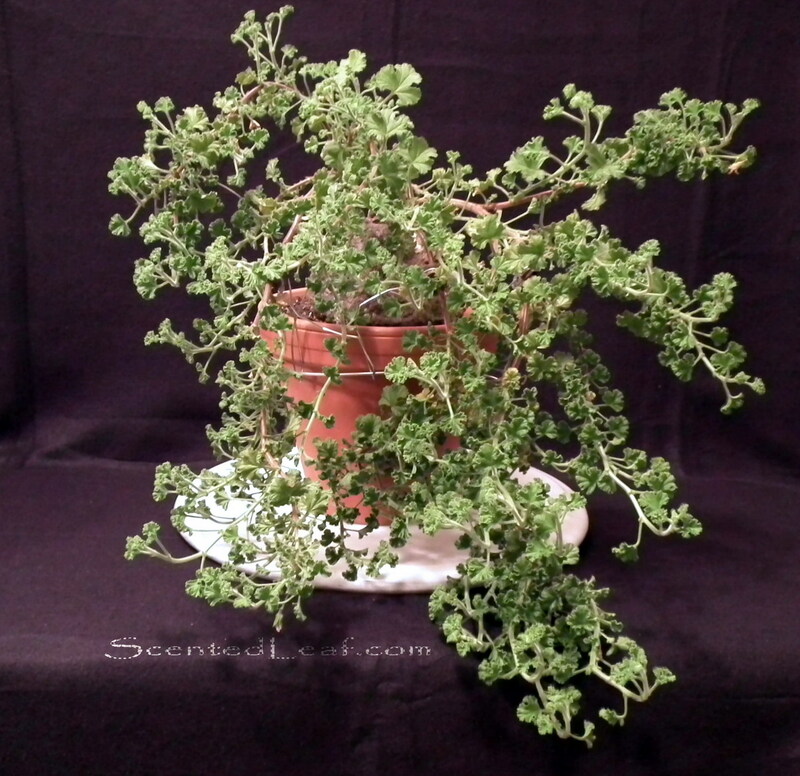 Boswellia Sacra, known also as Boswellia Carterii, has stiff, low branches and clusters of small flowers. when the trees are about 8 to 10 years old.